Swoop Plans To Fly To USA This Year. The Canadian company Swoop submitted a request to US regulators to begin flights to the United States on October this year. In an application with the US Department of Transportation. A Calgary-based airline, says it intends to fly from Canada to Las Vegas, Orlando, Tampa, Fort Lauderdale and Phoenix. The June 15 presentation does not specify which Swoop cities it intends to serve those destinations. The company tells that it expects to release more details near the end of July after it receives the approvals. 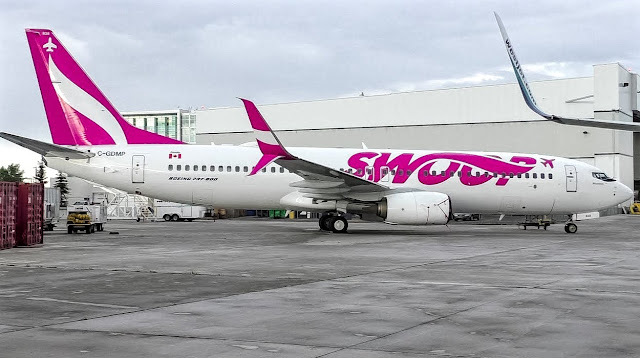 Swoop plans to start operations on June 20 with flights from Hamilton, which is southwest of Toronto, to Abbotsford and Halifax. Later that week, Hamilton-Edmonton and Hamilton-Winnipeg flights will begin. Initially, the unit will operate two Boeing 737-800 equipped with 189 seats, but plans to increase its fleet to 6 737-800 by the end of 2018, according to the regulation's presentation.